CHICAGO, Nov. 18, 2015 /PRNewswire/ -- Wicked Entertainment is set to release "Trust None" Chicago's first gangster film about trafficking "Syzurp" or ( lean) a potent prescription cough syrup, from Houston to Chicago. The film stars Chicago Hip Hop legend E.C. Illa (White Folks) and Eric Brown (Lil E) as two Uptown hustlers looking to cash in, at the same time uniting all street gangs under the umbrella of making money. The cast is filled with Chi-Town Hip Hop heavy hitters including Crucial Conflict, The Legendary Traxster, PsychoDrama, and more. Trust None is directed by Konee Rok & written by E.C Illa himself. 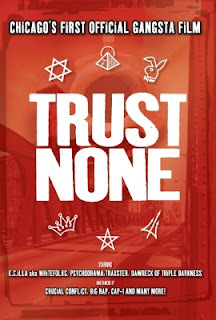 Trust None started film production in 2004 and was originally set for release that same year, however a partially complete version of the film was stolen from the producers and was bootlegged and leaked to the streets & eventually You Tube (garnering over 100k Views before being taken down). The bootleg version became an instant classic.The bootleg version of the film from 2004 remained the only version of the movie until a fateful day in 2014. In 2014 Chicago businessman and Executive Producer @SleepyWicked purchased a storage unit at an auction sale. The storage unit contained the original footage that was stolen from the producers years prior. Wicked Entertainment subsequently obtained the rights to the film and is now releasing it as it was intended. Wicked Entertainment is releasing this film utilizing today's On Demand Direct to Consumer model & on DVD through its national distributors. Accompanying this official release will be a brand new soundtrack inspired by the film featuring songs from today's Hip Hop artists' as well as gems dug up from their vault. Sleepy Wicked and Wicked Entertainment are currently planning a national exhibition for Trust None including viewing events and independent film festivals. Trust None is currently streaming at TrustNoneMovie.Com or WickedEntertainment.Net. Wicked Entertainment was established in 1993 as an Independent Record Label Investing & supporting the Chicago music scene with releases of classic Chicago Hip Hop, Latin Rap, Ghetto House, & Gangsta Rap. Many of the releases from Wicked Entertainment have been touted as classic & History making music, and has reached sales in every market in the U.S. Sound scan report & Billboard Charts. Wicked Entertainment is dedicated to Investing & believing in Chicago's music & Film talent.